We are engaged in processing the fine quality of Abalone shell mother of pearl mosaic tiles that is processed by using the sophisticated technology. Our products have attractive colors that enhance the beauty of the houses and hotels. We have the proper warehousing facility, with which we provide on time delivery of the products. To ensure the superior products to our clients, we check the quality before they are supplied to our clients. 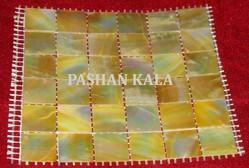 - Size 12 x 12, 15 x 15, 18 x 18, 24 x 24" inch and any customize size as per requirement. - Utilization Home decoration, Kitchen, Floor, Bathroom, Hotel, Bungalows etc. 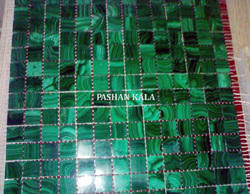 We are engaged in offering an exclusive range of Malachite Tile Back On Net/Mash at market leading prices. The offered Tiles are designed with the hard work and dedication of our craftsmen, who put in their best efforts in order to offer flawless range. For the people who want to design their interior unique from others, we are providing the fine quality of Yellow Mother of Pearl Mosaic Tiles that is processed under the guidance of our expert supervisors. These products have smooth texture but they are not slippery. These products have various natural shades that bring natural feeling to our clients. With the large distribution network, we ensure the on time delivery of the products. We assure the superior quality of products. Our products are so beautiful and attractive that you don’t want to remove your eyes from them. These products are available in the market leading price. Lapis lazuli and Malachite is comparatively a rare semi-precious stones that has been prized since archaism for its intense color. 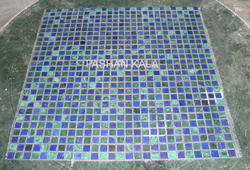 Being a leading manufacturer, we are engaged in processing the fine quality of Mosaic Melachite Tiles that is processed by sophisticated technology. Our products are very beautiful and are applicable in the flooring of office, houses, restaurants and farmhouses. This pattern to flooring gives the new look to the interior and enhance their beauty. Quality of the products is always checked by our expert teams before they are supplied to our clients thus we ensure the defect free products. 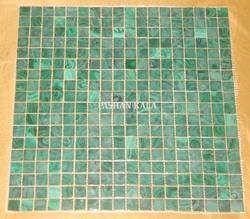 We are a progressive manufacturer and exporter of Abalone Mosaic Tiles. We offer a wide range of Tiles in numerous size, design and pattern, as per the specific client requirement. Out range is widely accepted in the market owing to its compact design, durable and smooth surface finishes. 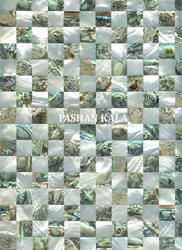 Client can avail these Abalone Mosaic Tile at a reasonable price. 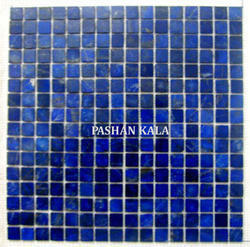 Looking for Gemstone Mosaic Tiles ?